Reducing noise from wastewater and drainage systems in the home is not only about environmental quality but about quality of life. Huliot’s Ultra Silent™ and Ultra Silent Plus™ present systems that are so effective and affordable it doesn’t make sense to install anything else in a new construction project. Huliot’s Ultra Silent™ is an effective non-pressure soundproof wastewater and drainage piping system made of mineral-reinforced polypropylene compound (PP-MD). Available in diameters from 32 mm to 200mm, Ultra Silent™ products comply with all mechanical and measurement requirements (EN 1451-1) and suit above and below ground installation both inside and outside the building structure. The system fittings are produced from black PP-MD compound and sealed with SBR-NR seals. All pipes have three layers to provide the highest mechanical performance. External black PP layer provides high-impact strength and excellent UV resistance. Intermediate PP-MD layer provides acoustic insulation and increases the pipe stiffness. Internal low-friction white PP layer provides the best flow performance, high resistance to chemical agents and high-definition contrast for visual monitoring. Swept branches improve the flow rate and reduce turbulence flow and accompanying airborne noise. Extra socket depth for increased connection stabilization. Best resistance to corrosive materials and longer lasting than other plastics and cast iron: durable for 100 years, according to raw material manufacturers, and more than 50 years, according to confirmed standard cycle test results . Environmentally friendly: most neutral material with the smallest carbon footprint and without risk during the material and product production process; 100% recyclable. Huliot’s Ultra Silent™ systems carry the Green Label licenses by World Green Building Council (WGBC). Negligible linear expansion in any direction and no need for special fittings. See system presentations and reference projects in the Media section. For details about the Ultra Silent™ program, see the Ultra Silent section in the e-Catalog (includes technical specifications and logistics information for each assortment). Airborne noise – comes from pipelines and is generated by wastewater flowing inside. In this case, a soundproof drainage and wastewater system should limit the propagation of airborne noise and keep it inside the pipes. This is achieved by using a specially formulated material (using minerals), a three-layer pipe structure, high manufacturing quality and correct installation. Structure-borne – noise comes from pipes and fittings as well as the system of fastening to the building’s structure such as brackets and clamps. This sound comes from the noise inside these systems, which makes them vibrate (acoustic resonance). The resonance is transmitted through the pipe clamps to the building’s structure and is heard in neighboring rooms as an irritating acoustic wave. 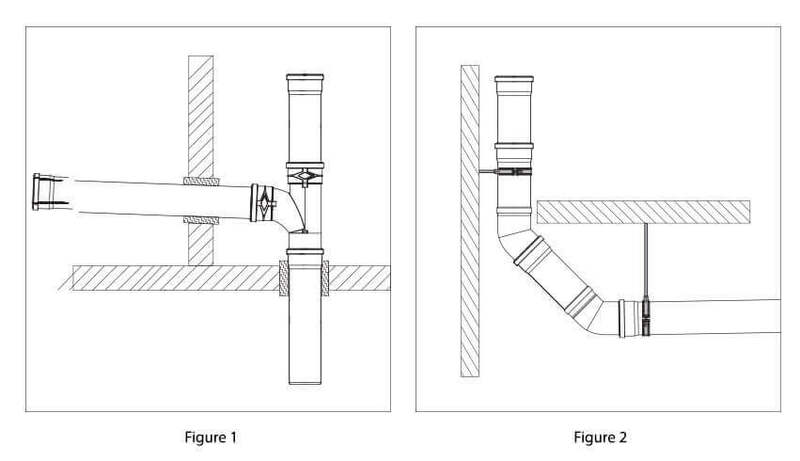 In this case, it is important to design the system of fastening pipes and fittings to the building’s structure in such a way that the acoustic resonance is reduced to the minimum. The Ultra Silent™ system’s acoustic performance was tested at the Fraunhofer IBP Test Laboratory (Germany) in accordance with DIN 4109 and EN 14366 standards. The system assembly (illustration below), which was also tested at Fraunhofer, has 110 mm diameter pipes and fittings, and several basic pipe clamps (including, for example, Müpro DAMMGLUST yellow, Bismat 2000). 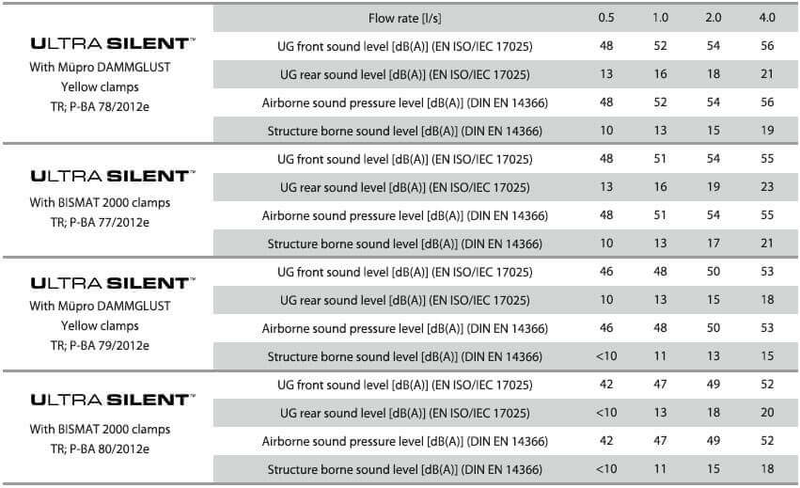 The table below details the results of the Ultra Silent pipe system’s noise reduction performance at various continuous water flow rates (0.5 l/s, 1.0 l/s, 2.0 l/s, 4.0 l/s). The results represent readings of the sound level taken and measured in the basement test room (UG at the front and rear of the wall, EN ISO/IEC 17025). Airborne sound pressure and the characteristic structure-borne sound levels were measured according DIN EN 14366. Download all Ultra Silent acoustic performance test reports from the downloads section. All materials comply with RoHS directive and are free of halogen and cadmium. Fittings made from black PP-MD for outstanding acoustic insulation. All products are connected by means of push-fit insertion, with single-lip high-quality SBR-NR seals to guarantee sealing and provide leakproof performance. The chemical resistance list is intended as a general guideline about the chemical resistance of the material and cannot simply be applied to all applications. The specifications in the list are not intended as a guide to determine the possible effects on the reagent. Mechanical behavior may be impaired in cases where tension and the presence of chemicals occur simultaneously (tension-fracture corrosion). The Ultra Silent system has been tested and certified by the IBS Institute (EN 13501-1:2009) and classified D-s2, d2. The system meets the requirements of EN 4102-2 with fire classification B2, smoke development category Q1 (low smoke development) and drip formation category TR1 (no drip formation). See the SKZ system certificate. E-modulus tested according to ISO 178 and reached 2,300-3,000 MPa for Ultra Silent and 2,600-3,200 MPa for Ultra Silent Plus. Coefficient of elongation was tested and reached the results of 0.09 mm/mK for Ultra Silent™ pipes and 0.05 mm/mK for Ultra Silent Plus™ pipes. All Ultra Silent™ system’s products are lightweight, making them easy to handle. Both the push-fit ring seal method and the Thread-lock™ with O-ring method install quickly and easily. To facilitate transport and storage, all fittings are packed in cardboard boxes. Pipes are packed in bundles or on pallets. Details about package dimensions, quantities, weight and other logistic information are outlined in the e-Catalog. Do not transport pipes and fittings unpacked (in bulk) along with other construction materials to prevent damage. Transport pipes in a horizontal position and protect against damage. Store pipes horizontally on even, smooth surfaces. Store cardboard boxes in dry areas to protect the content. Do not throw, drag or bend pipes and fittings when unloading them. For pipes traversing walls and ceilings, allow at least 30 mm between the pipe and any rigid material. to horizontal. It is preferable to use two 45° bends, with 250 mm minimum length of connecting pipe between them (Figure 2). It’s imperative to use acoustic insulated brackets for wall and sealing mounting and follow all instructions concerning the bracket assembling. 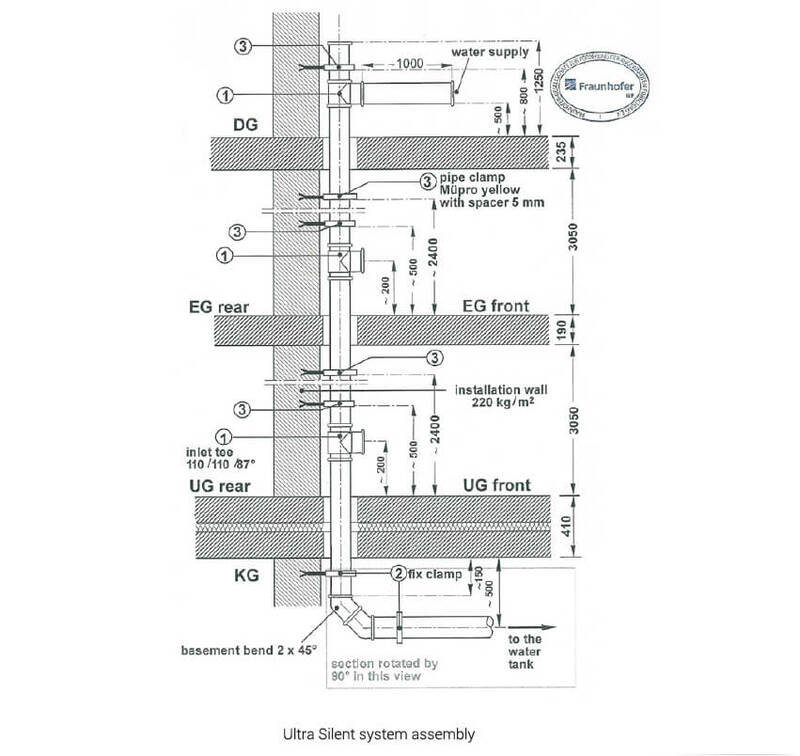 Read additional installation recommendations in the Ultra Silent manual and in the media section. Download the general manual for transportation, storage and installation (including repairs and nonstandard installations). Quality, Environmental, Occupational Health and Safety management. Quality management according to ISO 9001-2008, environmental management according to ISO 14001:2004 and occupational health and safety management according to OHSAS 18001:2007, approved and certified by Israel Standards Institute. Download certificates and approvals from downloads section. SKZ mark certificate no. A624. Fraunhofer IBP Test Laboratory reports P-BA 78-81/2012e (see acoustic chapter). Huliot develops and produces unique accessories to complete the Ultra Silent™ system range and to provide solutions for most plumbing and acoustic planner’s requirements. ULTRASEAL: A basic principle when installing an acoustic wastewater system is to prevent contact between the system and the building construction to avoid the creation of structure-borne noise (see product specifications and installation manual). In dry rooms, using soft foam is recommended; however, in wet rooms, where water passing between floors or walls is possible (bathrooms, balconies, etc. ), ULTRASEAL seals and prevents vibration transfer. It has a unique membrane assembly on the pipe with the sealing sheet deployed above the concrete foundation-floor and below the sealing materials and the floor finish layer (e.g., ceramic tile). Prefabricated fittings: Huliot’s prefabricated additions and custom changes (e.g., multiple branches, special diameters) for its basic fittings range provide a solution for special projects.